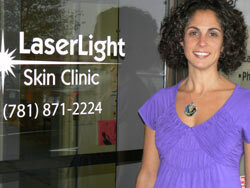 Welcome to LaserLight, and congratulations on taking a giant step toward looking your very best, from the Skin-Side Out™! What do you get when you visit LaserLight? The confidence that comes with an improved appearance! Whether you came to LaserLight’s website to learn more about our permanent hair removal services, our skin rejuvenation treatments to clear up imperfections to get a younger look, or how to get a bright, beautiful smile with our light-accelerated Express Teeth Whitening system, you have come to the place that welcomes you, a place you will find to be private, cost-effective, expert and comfortable. LaserLight caters to men as well as to women. We offer a private setting with private parking, and we schedule appointments so as to ensure your privacy and minimize wait times. LaserLight is conveniently located at Queen Anne’s Corner in Norwell, a two-minute jump off Exit 14 on Route 3 — an easy, quick stop on your way home from work, before grocery shopping, while the kids are in school. We offer convenient hours from Tuesday through Saturday, with evening appointments available to fit your busy schedule. We are thrilled to provide services that change people’s lives: our clients literally hold their heads higher when they lose their unwanted hair or embarrassing skin imperfections, or when their smile sparkles. They typically present themselves with a renewed confidence after being treated here. Join the hundreds of happy LaserLight clients who believe that Appearances Matter — Confidence Counts, and that LaserLight provides the very best in aesthetic laser treatments! We provide laser services for clients from Abington, Boston, Braintree, Bridgewater, Brockton, Canton, Carver, Cohasset, Dedham, Duxbury, East Bridgewater, Halifax, Hanover, Hanson, Hingham, Hull, Kingston, Middleboro, Milton, Newton, Norwell, Norwood, Pembroke, Plymouth, Quincy, Randolph, Rockland, Sandwich, Scituate, Stoughton, Wareham, West Bridgewater, Westwood, and Whitman. We draw clients from Massachusetts, Rhode Island, New Hampshire, Maine, and Vermont.